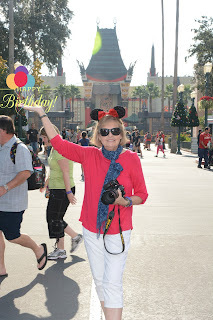 Celebrating a birthday while on vacation in The Disney Parks is always a special event and Disney has provided fun free perks to make it even more memorable. It all starts when you book your resort hotel reservations. Inform your Travel Agent, Disney Member Services or make a notation in your reservation online requests that someone in your traveling party is celebrating a birthday. Provide them with their name and age. Once that’s done the information is in your file and on your reservation for all Cast Members to see and hopefully act on. 1. Upon checking in to your resort mention to the Cast Member that there is someone celebrating a birthday in your group. They should already be aware of this as you list your birth dates on your reservation. It’s always good to *remind* them just in case the information somehow isn’t there. Sometimes they will have prepared a little something special. We’ve had a surprise balloon delivery, a towel decoration adorned with pins and a bottle of champagne delivered once on a cruise. I’ve heard of autographed character pictures too. There are no guarantees, it’s Disney magic when and if it happens! 2. All Guests (including those staying off-property) visiting the Disney Parks are welcome to enjoy this next perk. Visit the Guest Services in any of the parks to obtain a “Happy Birthday” button similar to the one pictured above. The birthday persons name will be hand printed on the button by a Guest Services Cast Member. In the Magic Kingdom you would visit “Town Hall” on Main Street next to the Fire Dept. Wearing a birthday button always attracts special attention from the Cast Members. Sometimes a smile and a “Happy Birthday”, a part in a parade or show, even a FastPass. 3. 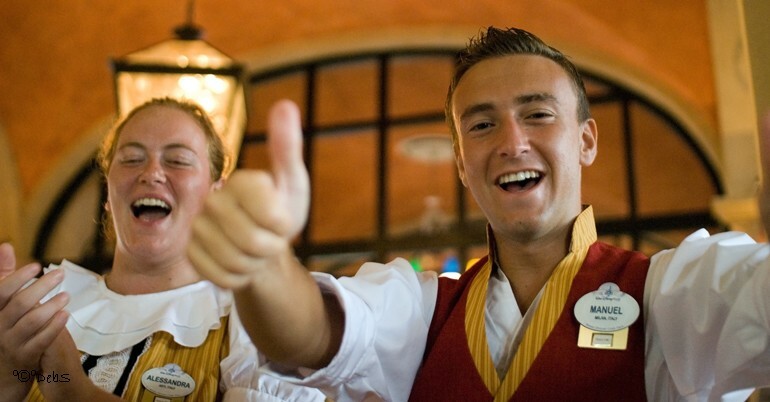 Wherever you are dining in the Parks you should tell the Cast Member at the podium when you check-in for your dining reservation. They will make note of it and may already have it in your ADR. Ideally this information is then passed on to your server but it doesn’t always work out that way. Mention it to your server after you are seated. Most table service restaurants have special birthday desserts that are often accompanied by a song. 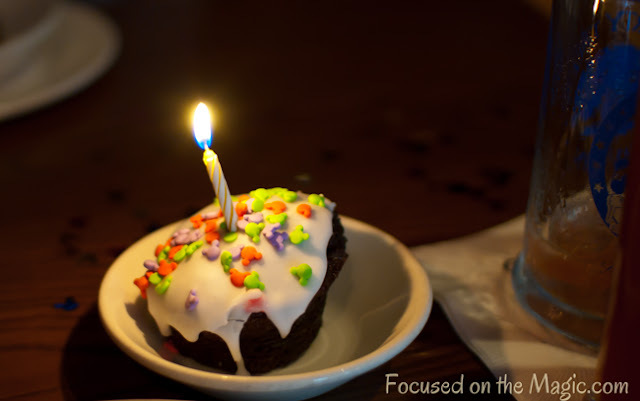 Via Napoli Cast Members sang the “Happy Birthday” song to me in Italian along with a special dessert with a candle, Le Cellier and The Grand Floridian have special birthday plates of chocolate, Liberty Tree Tavern has a birthday table decorated in glitter. Counter Service Restaurants often give the birthday person a cupcake, cookie or brownie and sometimes they’ll stop everything to sing a song. Pizzafari is great for that! 4. 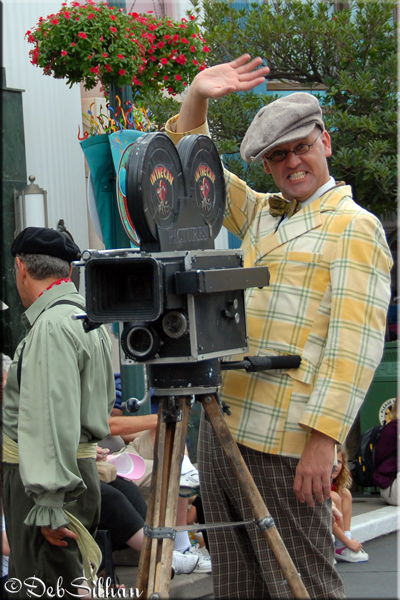 While in the Parks be sure to tell the PhotoPass Photographers that there’s a birthday boy or girl in your group. They may ask them to strike a special pose. The final picture might include some unexpected Disney birthday magic. Have Photopass take a picture using your camera of the Birthday Guest. When you get home you can makyour picturee it a magic shot by adding png image of birthday balloons to the picture in PicMonkey which is a free app. 5. If you are staying on property ask the front desk or concierge desk about a special birthday phone call from one of the characters. If they can manage it you may have a fun surprise waiting for you on your room phone! Although the next few perks aren’t free, they are inexpensive and will add to the birthday magic without busting your budget. When the characters sign your child’s autograph book make sure they know it’s your child’s birthday and mention their name, the character might surprise them with a birthday greeting. When my boys were young I would bring a large birthday card from home with my son’s name on it for the characters to sign. It makes for a cute addition to a birthday page in the scrapbook. You could have them sign a birthday, anniversary, graduation, get well or special occasion card to give at a later date. One last thing. "Grownups" are treated equally when it comes to celebrations in Disney Parks. You are never too old or too young to celebrate. Live it up and join in the fun! Do you have any free birthday perks you’d like to share?